Thursday, October, 4th 2018 I went out to celebrate the AWESOME 2’s 35th ANNIVERSARY which took place at the Highline Ballroom (431 West 16th St, NYC). 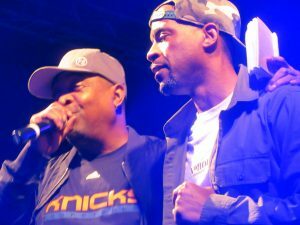 This event would show Hip Hop Love and Honor to Teddy Ted and Special K aka The Awesome 2! 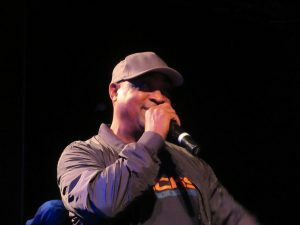 The host of the evening was the one and only, Legendary Legend, Chuck D of Public Enemy. I was excited to see what other Legends would be in the building. When I arrived, I seen a ton of Hip Hop Heads who I’ve been seeing often lately with all of the Hip Hop Anniversaries happening this year. 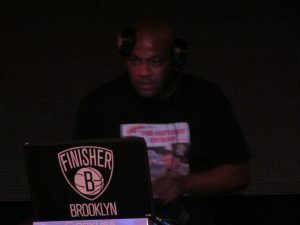 Next up, one of my favorite Brooklyn Legends, DJ Mister Cee (@DJMisterCee) aka The Finisher, jumped on the turntables and continued to hype us up. He gave shoutouts to Kool DJ Red Alert, Special K and Teddy Ted. He shouted out Marley Marl, letting us know, Marley Marl was someone he came up under. He also gave a shoutout to the late-Great, DJ Mister Magic (RIP). He then had us doing some old school dances like THE WHOOP. We all Whooped it out. Then the Finisher gave us some Brooklyn Tunes. 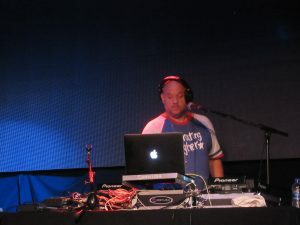 Before Chuck D (MrChuckD_PE) took the stage, we were treated by some other legends on the turntables but I was especially hype when another one of my New York City favorite DJ’s stepped on stage and got busy. Ted Smooth (@TedSmooth) rocked out for a bit. I love when I get to see him on the 1’s and 2’s. He has a very unique playing style. Ted Smooth warned us, “Stay With Meee!” because he will, for sure, take you on a Musical Journey like no other, hitting every NYC Boro. Promising to take you through many classic moments in music history. 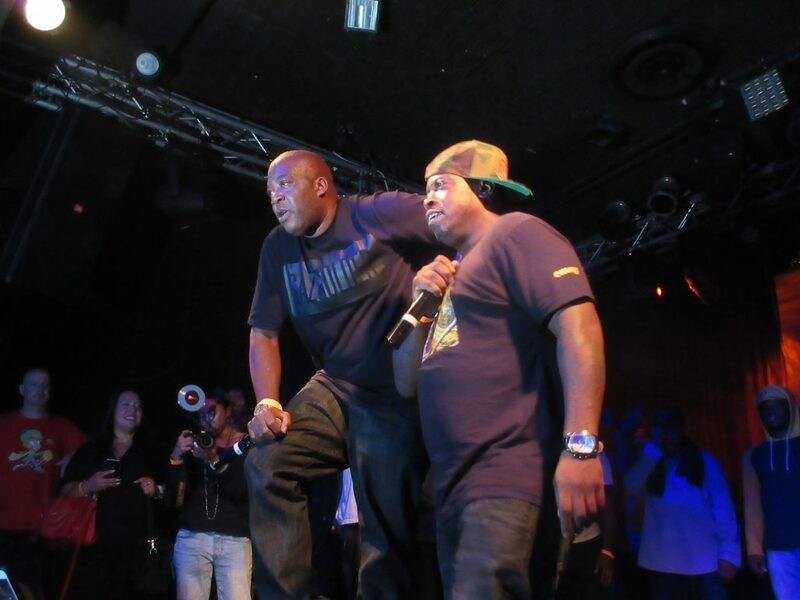 Mister Cee came back on the MIC and gave a few Shout Outs to more Legends who had stepped in the building. I was becoming overwhelmed. Felt like I was caught up in an old school episode of Video Music Box. Reliving the many nights I would tune in and wish I was old enough to be there; out at one of the parties VMB was taping Live from. And here I was. In the mist of Hip Hop at its Finest. Live and Direct. Literally standing next to Legends. Sharing the same energy as them. Recognizing how common this has been for me this year. Ironically, many of them knew who I was. Whether from them seeing me out at other Hip Hop events or from my comments on their Social Media page as I commonly Saluted them. 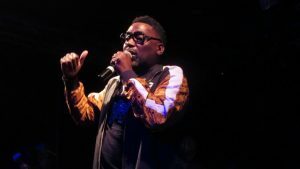 After he gave us a few classics, BIG DADDY KANE took time to express how far back he went with the Awesome 2’s. BDK let us know before he even had a record deal, he would be up at the station during the Awesome 2’s show and he’d be answering calls for them. 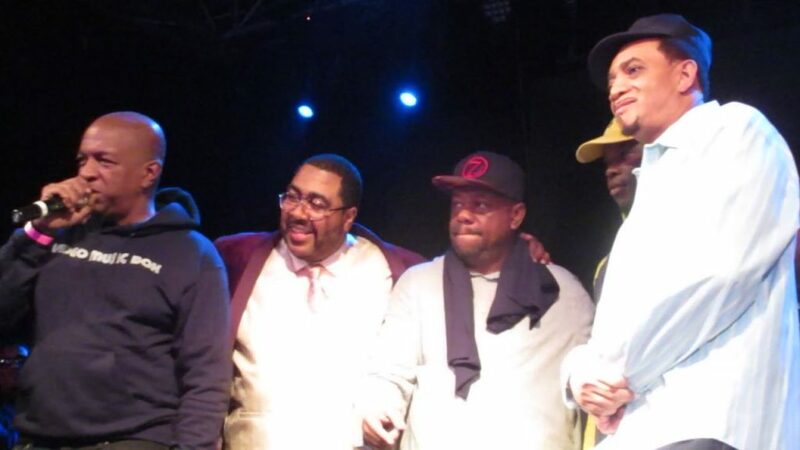 Also on Tuesdays, at LATIN QUARTERS, BDK and Mister Cee would be in the Awesome 2’s HipHop Competitions and they always showed him Mad Love so, he said, it was only right that he came out to Salute them on this night. 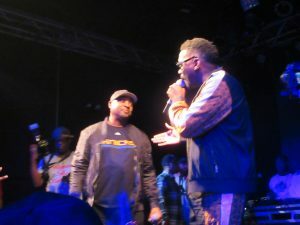 We were only about 45mins into the celebration and there was a long list of Legends who were expected to hit the stage. I was praying my SideKick (my purple trusted Canon Powershot ELPH 360HS point n shoot camera) would hang in there for me. I was kicking myself for not buying an extra battery earlier that day but hopeful the 2 I had would suffice. 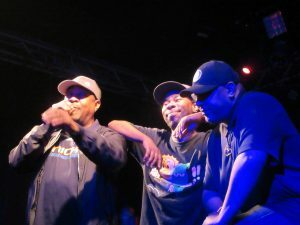 As if we weren’t already getting more than we paid for, Chuck D announced another Living Legend who I had never seen perform live but remembered my dad (RIP) playing “Money” (Dollar Bill Ya’ll) as if it was his soundtrack for the night at hand. It never failed, each weekend while my pops got dressed to a “T” to head out and hit the New York City Streets, this is what was played. 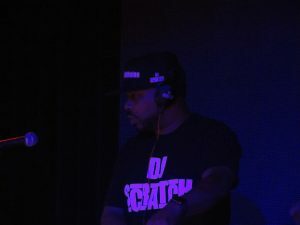 What’s a Hip Hop Celebration without JamMaster/GrandMaster, DJ Scratch stepping to the 1’s and 2’s and goin’ Ham?! If being a Turntablist was a crime, he’d have many charges against him! No cell could hold him because he’d raise the damn roof on that too! Needless to say, he got busy on the turntables with a mind blowing set where he blended a few songs to warm up a bit. Not that he needs it since its always clear, he could slay turntables in his sleep! I was Mesmerized. 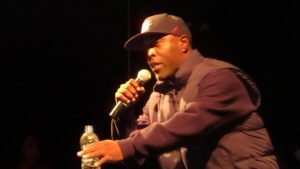 At some point he had us put one finger in the air for B I G and then asked what local NYC Boros (and surrounding areas) was in the building… Biggie Smalls “10 Crack Commandments” played as he spoke over it. We were all there! 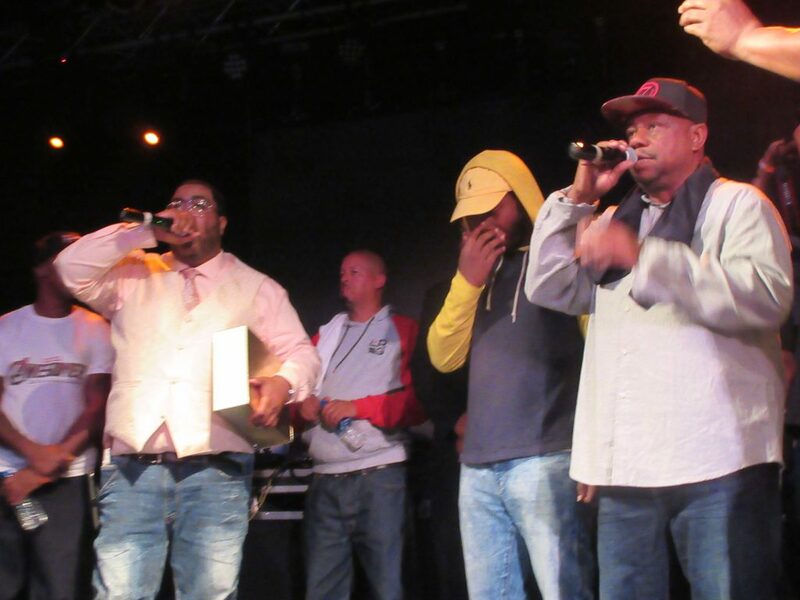 Queens, Bronx, Manhattan, Staten Island and BROOKLYN, Yea, we were in there DEEP! Including Long Island, New Jersey, Connecticut and even further than that. 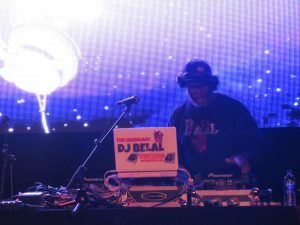 To Spread Love, because That’s how We Do in B-K, The Turntable Whisperer used Biggie to help recite the Area Codes by turning the Ten Crack Commandments into the New York City Area Codes. He said to make noise when we heard our code but I think we were all in amazement. For about 35 seconds we were just STUCK in a zone! Now, I’m sure, all of us who were there will Never hear that Classic Hit the same ever again. 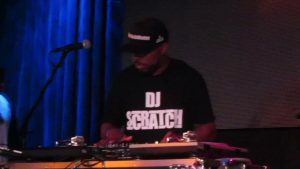 After his set, DJ Scratch took time to say some words, First about How and Why he launched SCRATCVISION TV/Radio Network (www.ScratchVision.com), and letting us know it wasn’t until After he started his own Station, he was given an opportunity to be on NYC Radio. How Ironic is that. 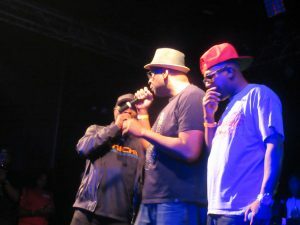 DJ Scratch’s goal was to get all of the Legends who had been pushed out of (mainstream) radio, onto his network. 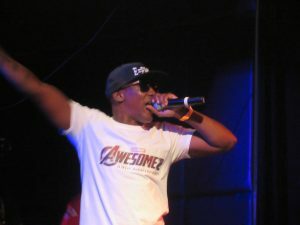 Currently, the Awesome 2 can be heard Every Friday at 8pm EST on ScratchVision so be sure to check them out. Please note, there’s a FREE Scratchvision app Avavilable on AppStore & GooglePlay. 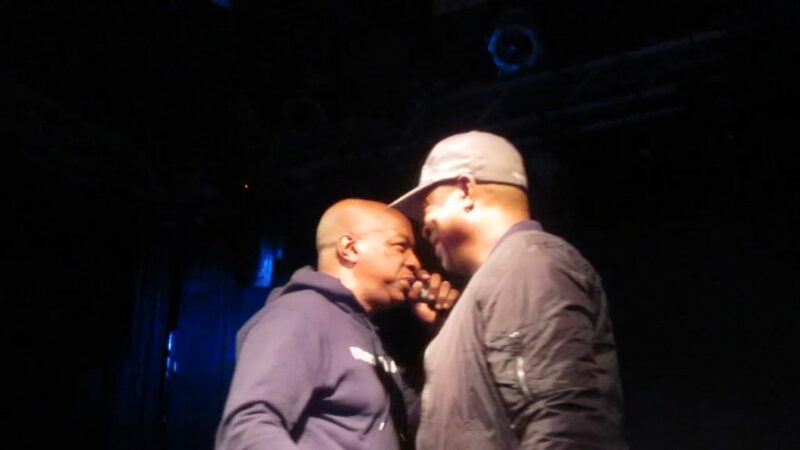 Ralph McDaniels came on stage with Chuck D and gave examples on how they get mistaken for one another. I laughed because I Too use to get them mixed up. 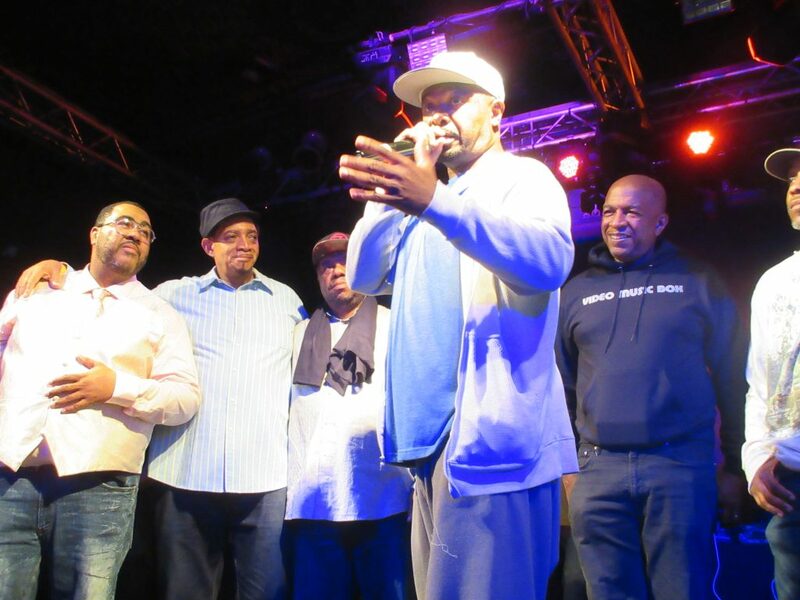 Uncle Ralph then called the Awesome 2 and Red Alert on stage for a picture which would be a Classic shot because they were All Celebrating 35 years. When uncle Red Alert took the Mic, he let off so much history regarding the Legacy of Hip Hop, letting us know, the Awesome 2 use to do their radio show in the basement of a tenement building. Uncle Red said 35 years was an important year. That’s why they were all celebrating to the fullest. Needless to say, this Celebration of the AWESOME 2 was more like a party. 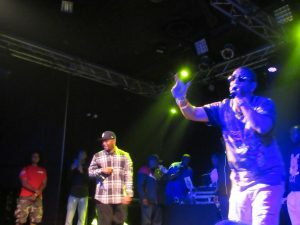 There were many Hip Hop Heads of ALL ages in the building. 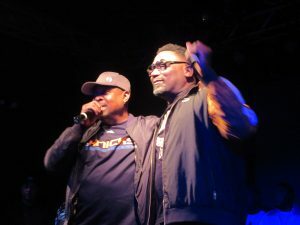 We were taken on a musical journey that allowed some of us to travel back into time to where we were when we 1st heard the Classics played by the DJs and performed by the Legends. What a Dope Night it was. 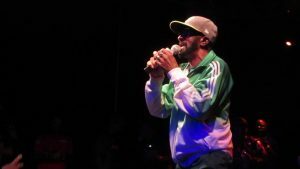 HIP HOP U THE LOVE OF MY LIFE! Forever! This entry was posted in ALL ABOUT HIP HOP, WHAT'S THE WORD. Bookmark the permalink. Thank You!!!! Im just waiting for you to come thru NYC so I can take u to some dope spots with dope hip hop shyt! And you need to come to an event one day! I always appreciate you for keeping me abreast with bdays and anniversaries of legendary shyt in hip hop and music in general. Without you, id miss a ton of stuff! SALUTE!!! Dope, as always. I love reading your blog because between your description and the videos/pictures….it’s like I was there. Thnx. Thats the goal. I feel bad knowing so mnay hiphop junkies like yourself who are too far to experience these types of events but I do my best bringing it to yall as if you were next to me or in the same building!!! Anytime you want me to call in for a re-cap of any events, let me know! It was amazing. Thank U for reading!!! Wow!! I really enjoyed this, Sis…once again as if I was there with you. 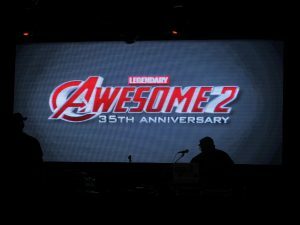 What’s so crazy, I didn’t know who the Awesome 2 were – this so some serious edu-tainment! There were a few parts that had me giggling. Like for example when you felt like you were on an episode of VMB & when you said Black Rob was like whoa. LOL straight to the point – I love it! I have to go back and watch all of the video links. But girl, that night was LEGENDARY! Can’t believe Greg Nice performed with stitches. Wow. Thanx for reading and Yes, be sure to watch videos. Esp Greg Nice video bcuz he spoke some real shyt,,, started off telling the sound guy he had to do better with sound, lol. but had he not said he was str8 out the hospital, we wouldve never known. I failed to mention, he Too has been in this business for 35 years bt he mentions it in the clip… Stay tuned for more…. thank you tye for your support for us on this incredible night for us!!!!!!!!!!!! this special k from awesome please reach out to me!!!!!!!!!! Thank you so much. I really appreciate you reaching out to me.I am not sure the best way to reach you so please send me an e-mail. BklynTyeNYC@Gmail.com. Thank you again for your contribution to Hip Hop!